On January-23, just before Apple shares began their 12% decline, we saw this pattern on the daily chart and warned of the potential for a deep pullback. 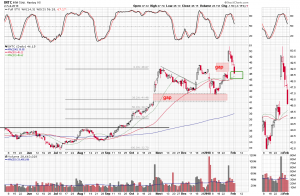 Apple is back in the $180 area, watch out for dojis. So, the sell-off on Wednesday contributed to the formation of another high wick candle on the daily chart. The gap down near $168 may have to be filled before Facebook shares make a new all-time high, particularly if another doji cluster forms. The Facebook (FB) chart was trying to tell us something on Tuesday. An eveningstar formed on the daily timeframe. An eveningstar is a three-period reversal candle pattern that is often seen at important tops. It consists of a large up-day candle, followed by a small opening and closing range “doji” candle, and completed by a large down-day candle. It represents a transition from bullishness-to-bearishness. The moving average convergence/divergence indicator at the top of the chart has been tweaked to reflect the weekly MacD oscillator reading. It made a bearish crossover months ago and has been tracking lower, suggesting an internal loss of positive price momentum. 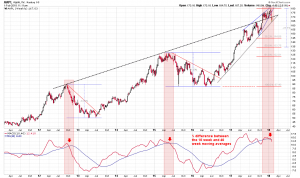 The Chaikin money flow indicator at the bottom of the chart has also been heading lower. This lethal combination of price action and money flow caught up with Facebook earlier this month, and it continues to be a drag on the stock. How do you aribitrage Bicoin? Good question. Check out the answer by Stefan Qin, Virgil Capital founder, on CNBC’s “Fast Money” program. One hedge fund manager has found a way to make money on bitcoin, whether it goes up or down from CNBC. 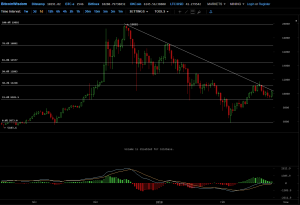 Bitcoin retraced back up to the 38% Fibonacci retracement level of its all-time high and February low. This Fibonacci level intersected with the downtrend line drawn off the December 2017 and January 2018 highs, presenting reinforced resistance. At this point, just as it did in January, a bearish eveningstar reversal pattern formed on the daily chart marking a top in the short term uptrend. An eveningstar is a three-period candle pattern that consists of a large up-day candle, followed by a narrow opening and closing range doji candle, and completed by a large down-day candle. It represents a transition from bullishness to bearishness. Monday’s bullish large body candle held above the 23.6% retracement level and is retesting the downtrend line. In order for the eveningstar pattern to be negated, the 50% retracement level needs to be recaptured and price advance from there. The Retail Investor Left Out – While XIV Trade Was Done In Secret Behind Closed Doors…At Night. First, let’s understand what did not happen. The now infamous, VelocityShares Inverse VIX Short Term ETN (XIV) did not malfunction; it did exactly what it was supposed to do. It dropped 90% when the Volatility Index (VIX) dropped 45%. The problem that many people have been highlighting about the XIV is that individual retail investors should not be using this particular product as a trading vehicle. That is absolutely true but retail traders did not start the cascade of selling in the VIX. In fact, they were deliberately kept out of it. The VIX is a tool primarily used by hedge funds and institutions, and these “market participants” don’t like to make their trades public. They find liquidity in “dark pools” which are private and unseen markets of liquidity. And they often trade after-hours or in the pre-market. That is what happened on Monday and before the market opened on Tuesday. Undetected pre-market and post-market trading, disclosed at the open on Tuesday. So, in my opinion it wasn’t the product that hurt the retail investor. It was the fact that a majority of the trading that took the XIV lower was done at night…behind closed doors. The retail trader was left out of the trade until it was too late. What would Michael Lewis say? Shares of a popular exchange-traded fund designed to bet against volatility plunged in after-hours trading on Monday. The VelocityShares Daily Inverse VIX Short Term ETN XIV, -14.32% lost 62%, after getting crushed 14% in the regular session. Meanwhile, an exchange-traded fund designed to bet on volatility surged after-hours, as the Barclays Bank PLC iPath S&P 500 VIX Short-Term Futures ETN VXX, +33.48% leapt 32%. Volatility ETN crashes from CNBC. The rapid unwinding of complacent markets may have claimed its first victim after a Wall St exchange-traded fund which gains from falling volatility crashed in after hours trade, triggering the closure of a related Tokyo-listed product. The $US2 billion VelocityShares Daily Inverse VIX short-term exchange-traded note, trading in New York under the ticker XIV, was hammered 14 per cent overnight as the volatility index, or VIX, spiked amid the worst fall for US stocks since August 2011. But in after hours trading the fund’s price crashed from $US99 at the close to $US20, or by just shy of 80 per cent, Simon Ho of Triple3 Partners told The Australian Financial Review. That had analysts wondering whether investors had grown nervous the fund would trigger a clause in which the fund would wind up in the event of losses in excess of 80 per cent. The inverse volatility listed indexed fund dropped over the regular New York session on Monday night only to crash in after-hours trade. “It’s hard to say whether [traders] at the end of the day knew that it was going to be in breach of that rule,” Simon Ho of Triple 3 Partners said. Mr Ho is an expert in volatility and manages the Volatility Advantage Fund. In a strong sign of things to come, this morning Nomura Europe Finance announced that its Tokyo-listed exchange-traded inverse VIX product “will be redeemed early, after a condition for early redemption was triggered due to movements in the underlying index”. The XIV fund has proved extremely popular among investors who have bet on the extended period of calm on markets would lead to continuing low and falling volatility. Last year the fund made a 180 per cent return. But many experts, including Mr Ho, have been warning of the risks of a sudden and devastating effect a return to more normal levels of volatility would have on some of these products. 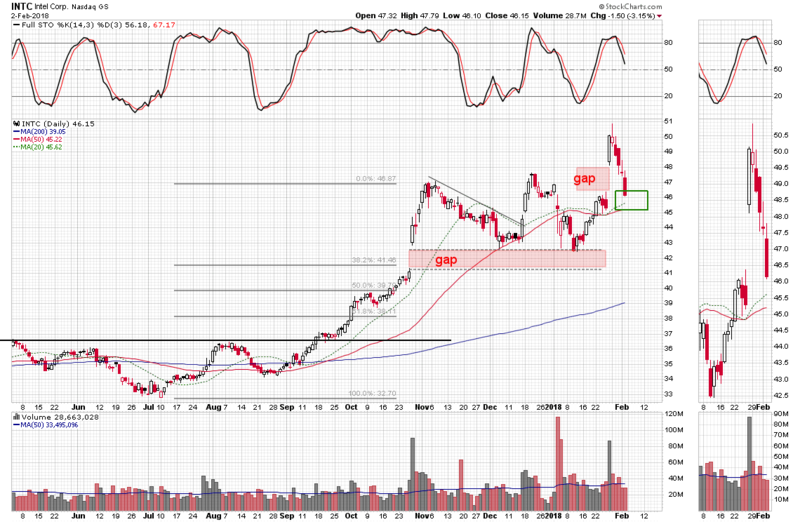 The 3% decline in Intel (INTC) on Friday down to $46.10 level, closed the most recent gap on the daily chart. 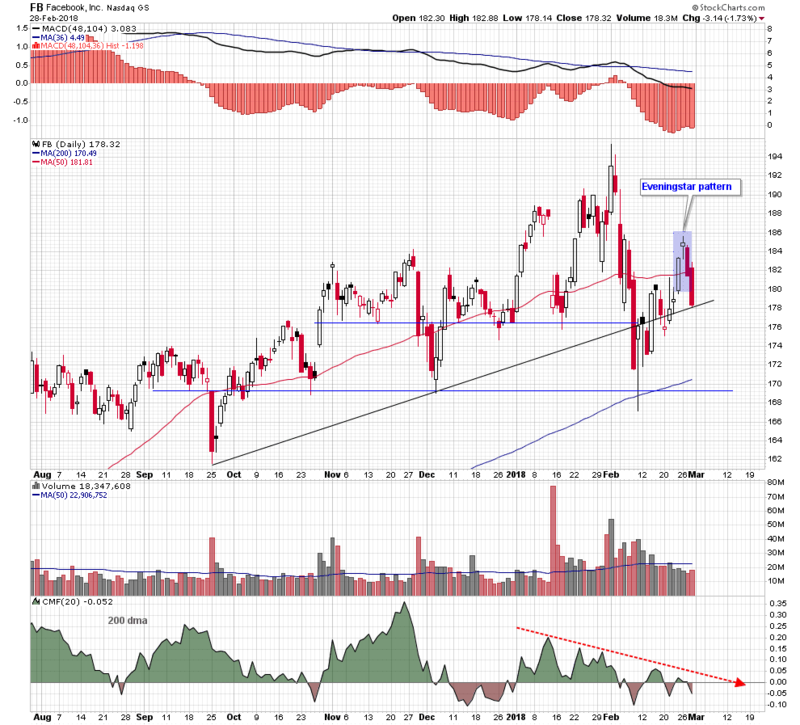 But shares of Intel (INTC) had been fading even before Friday’s sharp pullback. While the 50 day moving average is just about a buck lower and it could supply some near term support, the October gap is still unfilled and looms down at the $41 level. The stochastics oscillator has made a bearish crossover out of the overbought zone, reflecting the loss of positive momentum last month. 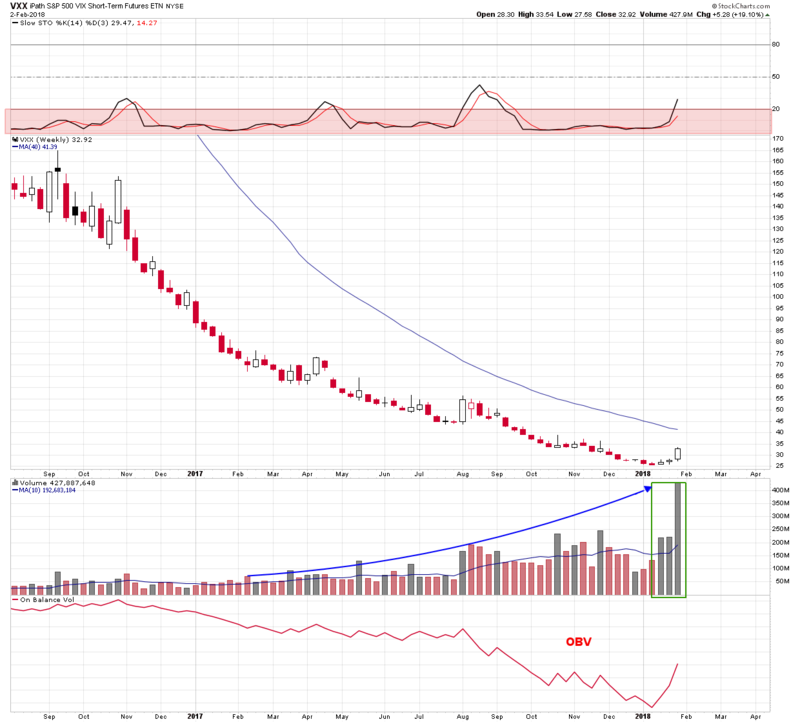 Chaikin money flow crossed below its 21 period signal average and is headed into negative territory. 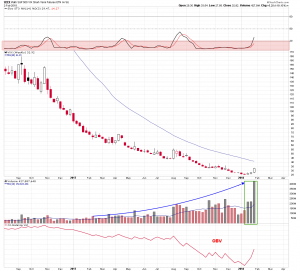 This is money flow confirmation of the downside price momentum. There could be a reflexive bounce in the broader market this week which could stabilize Intel shares. Watch the confluence of 20 day and 50 day moving averages and gap low support, just above the $45 level. 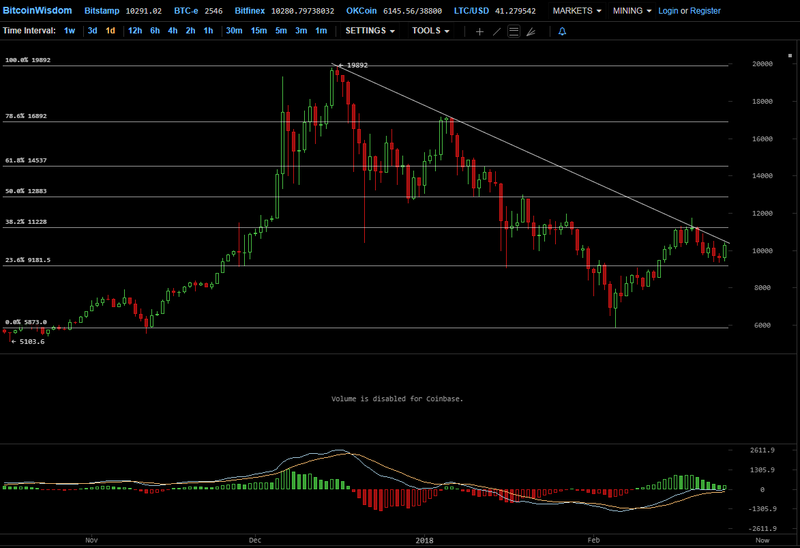 But if that area is breached the October gap would be the next logical zone of support. I wouldn’t say volatility is back but it made an appearance this week. The Volatility Index ($VIX) was up 56% this week and the iPath S&P 500 VIX Short-Term Futures ETN (VXX) was up 19%, its biggest percentage move since August last year. The volatility spike in the VXX this time was preceded by two weeks of stronger than average upside volume. This suggests that it may be more than a one off event. There may actually be some “fear” associated with the movement in the Fear Index and its proxy. The VXX weekly chart shows the stochastic oscillator rising out of a deeply oversold condition and the on balance volume indicator confirming the positive direction of this week’s money flow. If the market is preparing for a more meaningful pullback, money managers will be quick to protect their January gains. This means buying puts and while the VXX is a second and less efficient derivative of Volatility Index ($VIX) it should continue higher along with the underlying index. Stocks were down hard on Friday and volatility spiked. The market was unprepared but it should have been for several reasons. The major indices started the week lower and then gapped down on Tuesday. That was quickly forgotten by the end of trading on Wednesday, as they stabilized or moved slightly higher. 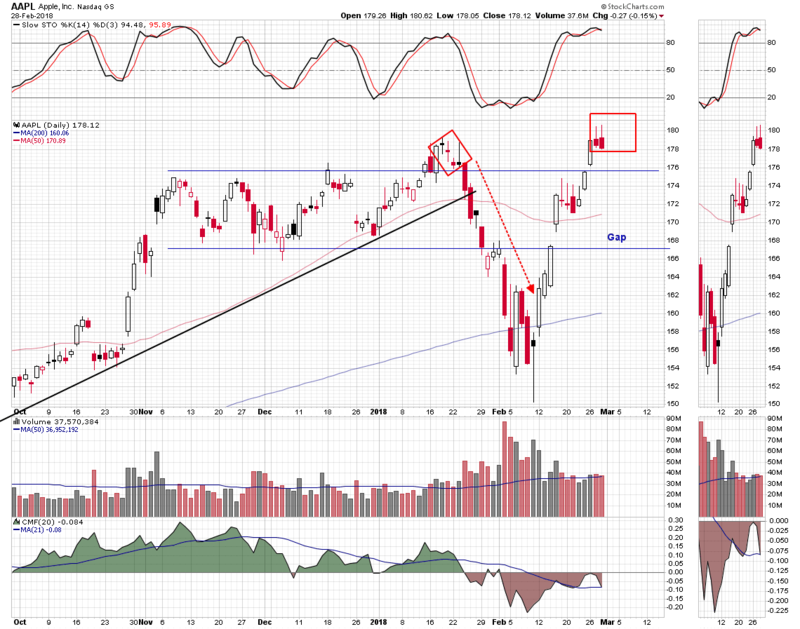 That is all the indices but the Russell 2000 SmallCap Index ($RUT) which slipped below its 20 period moving average and into lower Bollinger band range. I “tweeted” this out on Wednesday. It seemed important because of the small caps penchant for leading the broader market, and the short-term significance of the 20 day average. Then there were the warning signs on the FANG charts. The Facebook (FB) spinning top candle, an Amazon (AMZN) gravestone doji, the three-day eveningstar pattern, and Alphabet’s ominous doji cluster. The details are covered in this post. I have been noting my concern about the Apple (AAPL) chart for some time beginning here, here, and here. Also, Disney (DIS) has been a concern recently and was highlighted here, and with a follow-up here. This is not to say that these postings and tweets would be suggest that the Dow was headed for a 665 point drop. The signs were subtle and they did not suggest a drop in share value of this magnitude. But something was up. The Russel 2000 index does often lead the other indices either up or down and the 20 day moving average is the demarcation line of the bullish and bearish ranges of the Bollinger band indicator. There were serious warning candles on the FANG charts. 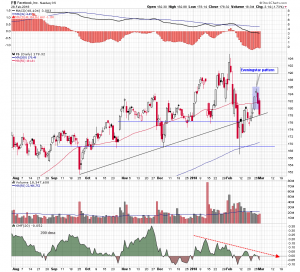 (Despite Amazon’s relative strength today, the chart still looks weak.) Those four names have been the lead dogs in the tech sector and the tech sector often leads along with the small cap stocks. Over the last several years the market has recovered very quickly from pullbacks. That might not be the case this time. Technical damage has been done to the charts, as well as psychological damage to investors thinking about the vulnerability of some of the biggest names in their portfolios. The weekly chart of Apple (AAPL) shows the six year Apple rally has been punctuated with two deep percentage corrections. These have occurred when the 10 week moving average has diverged sharply from the 40 week moving average. That same condition is in place on the chart now and it could be signalling another pullback. The graph at the bottom of the chart shows the relationship between the two averages and is overlaid with a 40 week moving “signal” average. Crossovers have signaled changes in the intermediate term direction of price. The average line is currently making a lower high in negative divergence to the rising stock price. 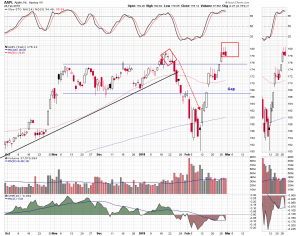 It looks like it is preparing for another bearish crossover below the signal line. The overbought condition reflected in the divergence between the moving averages is punctuated by the price action over the last nine months. During this time, a nearly vertical triangle has pierced a long term resistance line drawn off the highs of the charted period. The triangle pattern has been penetrated and Apple’s stock price and moved down to the uptrend line drawn off the October 2017 low and the October 2018 low. This is the last line of defense on this chart. Sustained price action below the $165-level could trigger the start of a deep and prolonged decline like we have seen two times in the past. A pullback to the 50% Fibonacci retracement level of the 2016 low and this year’s high would be a 25% move, and on the lower end of the two previous declines. This analysis is a very accurate and detailed account of what has happened in past when certain technical conditions were in place. Just because similar conditions are currently in place is no guarantee Apple shares will see another deep corrective move. It is, however, a warning sign to be alert to for those who are long the stock.